It is a Manager's responsibility to get the best possible performance from their teams. This means creating and sustaining a working environment that provokes individuals to feel psychologically well, so they can focus and concentrate on their work, enjoy working, feel a great sense of satisfaction at the end of their working day and want to come to work again the next day. A major inhibitor to achieving the best possible performance is stress. Stress is a reaction to something that makes you feel degrees of anxiety, fear and depression. Stress is most frequently caused by events and behaviours that run the risk of producing stressful reactions. The word 'stress' is, unfortunately, used to denote a broad range of sensations. The key thing to remember is that those feeling negative stress will be experiencing interference with their concentration which leads to under performance. Conversely, and perhaps paradoxically, those who feel positive stress (controlled pressure and tension) will find their concentration is more intense and their performance rises. Negative stress can be prevented if Managers behave and take action in ways that stop challenging events and difficult behaviours, created by themselves and others, from occurring in the first place. The fact that Managers can make a major difference to people experiencing stress, and to the performance of their teams, comes from the reality that organisations are controlled communities, controlled by managers. It is, therefore, in the gift of Line Managers to make the difference between low and high performance, by the way they behave, as well as their actions to prevent the events and behaviours that run the risk of causing stressful reactions in people. The purpose of this Guide is to raise awareness, impart some understanding and skills, and to make a difference. 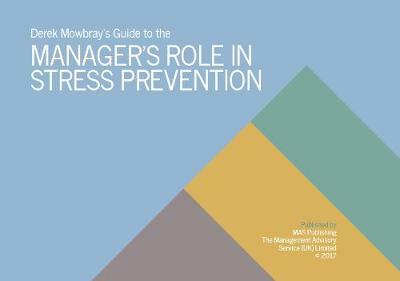 The Guide is intended to help Managers: f)	prevent events and behaviours that may trigger stressful reactions; g)	adopt behaviours that prevent stress in the workforce and, simultaneously, h)	create and sustain a working environment that enables the workforce to thrive and produce consistent peak performance; i)	recognise the signs of negative stress within their team and take the appropriate action.